Two more hours in Texas until GG!!! Cannot wait! Kate, enjoy tomorrow!!! 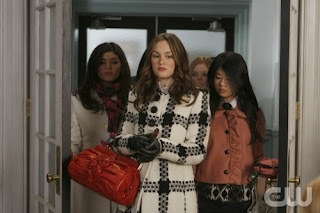 I love Blair's coat in the middle picture! I think maybe she's worn it before? I love Blair's coat, but i ADORE Nelly's coat as well. Blair's plaid blazer is Brooks Brothers and 50% off - I saw it today! Great post! Love the outfits!! Its starting again here (series two) on Wednesday - yay! (There was an article in Jan Vogue about how so many women twenties upwards watch and love the show - phew - it's not just me!). I ahve an award for you on my blog! Damn! I need to watch the show just for the clothes! Blair was particularly wonderful last night! I must say though, that I'm incredibly bummed that there will not be a new episode next week! I hate when they do this to us! Oh how I love Gossip Girl. This latest episode didn't have enough Blair&Chuck though. I loved Blair's look for the Opera. does anyone else want to rip nelly yukis tape off her glasses! I am so anxious to see what Blair is going to do!! I still have to watch this week's episode on the dvr. I love this show!